Chemical properties: This herb is rich with the known chemical constituents among others - fly oil. Pharmacological effects: nature - fragrant, anti-inflammatory, anti-dysentery, emenagogum. Part of plant used: Wood, leather and oil. Method of cultivation: Expand the plant by seed, cuttings and grafting, easy maintenance, basic fertilizer and enough water and light. 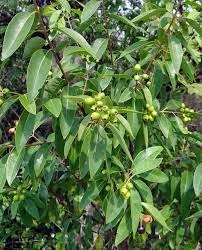 Plants annual tree sandalwood is very useful and widely grown in Indonesia. sandalwood has been used as building materials, furniture, craft or crafts, works of art, to the beads. However, behind the benefits of sandalwood which has been known since ancient times earlier, sandalwood plant is actually beneficial also for health. Yup! Helpful herbs for therapeutic treatment using sandalwood plants. The plant has the Latin name of sandalwood Santalum album Linn. In Indonesia alone, sandalwood is known by several names, depending on their respective regions, such as: Kai Salun, Hau Meni, Ai Kamenil, Hadana, Ai Nitu, Wasu Fund, Haju Mangi, Bong Meuni. Cedana Wood is a plant belonging to the family of the order Santalaceae and Loranthaceae. Sandalwood has two types, namely: red sandalwood and white sandalwood. Red sandalwood less fragrant and less good quality, so it is not very salable in world timber trade. Manifold red sandalwood grows in many areas Funan and India, while the assorted white sandalwood crop, widely grown in East Nusa Tenggara region, namely the island of Flores, Sumba, Alor, Solor, Adonara, Lomblen, Pantar, Timor, Rote and Sabu. Sandalwood is a semi-parasitic plants which obtain food from its host tree through the roots which are connected via haustori. Plants are used as parent plants sandalwood many kinds, not just menginangkan old sandalwood plants. Plants are used as the host usually: Acacia, Albasia, Dalbergia, Inga, Pongamia, and Reed. Sandalwood plants can be grown in areas that clearly the climate differences between the rainy season and dry season. Sandalwood is also very often grow in an area full of rocks or volcanic rocks that transmit the flow of water. Sandalwood plants can grow in the plains with an altitude of 1,500 meters above sea level. Sandalwood tree can grow to a height of 11-15 meters with a diameter of 25-30 cm. The stem is round and the skin is grayish-brown to red-brown. Branch started in the bottom half of the tree. Primary branches very irregular, often crooked and many branches. stems tend to grow hanging the chart below. Sandalwood leaves opposite each other, elliptical to lanceolate shape (oval) with two pointy ends. - Do this several times over several days until the menstrual blood is really clean. That's how to make herbal medicines from plants sandalwood, may be useful and more healthy!